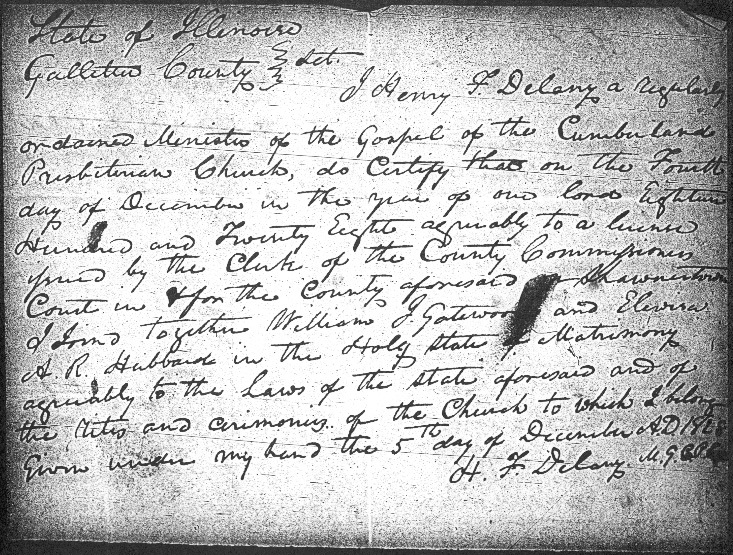 I, Henry F. Delany a regularly ordained Minister of the Gospel of the Cumberland Presbeterian Church, do Certify that on the Fourth day of December in the year of our lord Eighteen Hundred and Twenty Eight agreeably to a license issued by the Clerk of the County Commissioner’s Court in & for the County aforesaid – Shawneetown, I joined together William J. Gatewood and Elewisa A. R. Hubbard in the Holy State of Matrimony agreeably to the Laws of the state aforesaid and of the rites and ceremonies of the Church to which I belong. Entered under my hand the 5th day of December A.D. 1828. Elewisa Adeline Rumsey Hubbard and William Jefferson Gatewood married 5 December 1828 in Gallatin County, Illinois. Elewisa was the daughter of Adolphus Frederick Hubbard and was born about 1807 in Warren County, Kentucky William Jefferson Gatewood was born in Warren County, Kentucky, in 1801, the son of Williamson Gatewood and Elizabeth Hubbard. Elizabeth Hubbard and Adophus Hubbard were sister and brother and William Jefferson and Elewisa were first cousins. He came to Shawneetown about 1823 and was a merchant, lawyer and legislator from Gallatin County, Illinois. He taught school before being admitted to the bar in 1828. He was serving in the state senate in Springfield when he died in 1842, leaving Elewisa with several young children. Elewisa was appointed administrator of her husband's estate. Jarvis Pierce, also of Gallatin County, was appointed guardian of her minor children in September 1850: Williamson, Ephraim H., Nancy and Isaac. In July 1850 Williamson was twenty years old and listed in the census in Sacramento, California, working as a miner. The three other Gatewood children, Ephraim H., Nancy V. and Isaac I., were living with Jarvis and Elewisa Pierce and family in the 1850 census. By 1860 Ephraim H. was in San Andreas, Calaveras County, California - a steam engineer, age 25, born Illinois. His brother Williamson Jefferson was also in San Andreas, age 30, a lawyer, but they weren't living together. By 1870, "Jeff Gatewood" and his wife Mary (Crosthwaite), whom he married in 1857 in San Francisco, were living in San Diego. Jeff died there in 1888. In 1866 Jarvis Pierce filed for divorce, the grounds being desertion, and he married Unity Barnes, a servant living with the family in the 1860 census. The household was not a happy one: Unity gave birth to Jarvis' daughter Dora in late 1860. Elewisa put her household goods into a wagon and left, telling Jarvis not to try to find her. She was living with her daughter Nancy Addison and family in 1870 in White County, Illinois, under the name Louisa Gatewood. She died in 1877 in St. Louis, Missouri, where she is buried. The marriage license was issued in Shawneetown, Gallatin County. The copy of the certificate above was from FHL MF 969484, Illinois Marriage Certificates, 1813 - 1828 taken from the original records in the Gallatin County courthouse. On her daughter Mary Pierce Phillips' death certificate, her mother's name is given as Adyline Rumsey, with another name smudged out underneath. the name underneath looks like Elewisa Gatewood.